Benefits from these policies include 1,800 new in-state jobs (on average) and $263 million in economic growth per year – a total of $3.4 billion in growth over the period from 2018 to 2030 – as compared to a business-as-usual scenario. 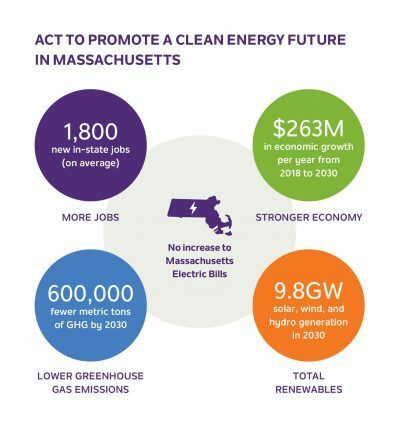 In addition, Massachusetts would build a total of 9.8GW of solar, wind, and hydro generation, emitting 600,000 metric tons fewer emissions by 2030 – equivalent to removing 128,000 cars from the road. These policies will help the state make progress toward its climate goals, but the results also show that more must be done in other sectors like transportation and buildings. In other words, it’s a down payment, not even a total conversion. But the states are where the action is on fighting climate change – and as I’ve mentioned, we are by no means alone. Bob DeLeo’s House is sluggish and cautious; the Governor exhibits no leadership. But the Senate vote was 35-0 — that’s remarkable, and if nothing else it shows a bipartisan consensus that clean energy is a priority — that it’s politically safe. It’s safer, in fact, than doing nothing this term: Witness Ways and Means Chair Jeffrey Sanchez, who was vague at best about supporting this bill in a candidate form Monday night (see this video, starting at 56:00), even as he’s being credibly challenged by young lawyer Nika Elugardo. In his very progressive JP district, I’m guessing that Sanchez had better deliver on this, and many other priorities in this session. Motivated by a sense of urgency for the Senate bill to pass the House before the current legislative session ends, local environmental activist groups Jamaica Plain Forum and 350 MA-Boston Node are organizing a Town Hall Forum with state Rep. Jeffrey Sanchez, D-15th Suffolk, who also chairs the House Committee on Ways and Means. Taking place at Unitarian Universalist Church on Eliot Street this Thursday, July 12, from 6:30 to 8:30 pm the town hall will aim to address Rep. Sanchez’s views on the MA Senate Climate Bill and his plans to get a MA House version passed before July 31. Again … for all the criticism I level at our Speaker and Governor, if this is on the list of achievements, that would indeed be pretty remarkable. You get credit, or blame, depending on what happens on your watch. A hero opportunity stands waiting for them all, if they’d just take it. Come join us for an insightful conversation about criminal justice reform in our district, and find out how the recent amendment H.4011 affects you! Speaker: State Representative Jay Livingstone RSVP Required: https://goo.gl/forms/vHu2pAzAeysGAwiE3 Contact: Rohini Shivamoggi (rohinis@mit.edu) Dinner will be served!